It's official. PDGA grabs another NEFA all-star! Congratulations to NEFA's own Marcy Borelli as she heads to the center of the disc golf world next week! 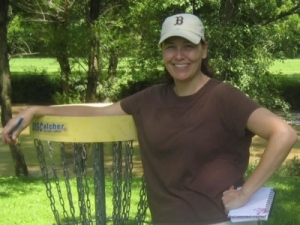 Marcy has accepted a position as the new office manager for the PDGA at the International Disc Golf Center in Appling. Marcy is currently the MA State Coordinator and has quickly made her mark in NEFA. I, of course, couldn't be happier for my wife! Marcy heads South next Sunday, the day after she TDs the King of the Hill B-tier at Devens. Who better to play in the home opener than the Yankees at Fenway. 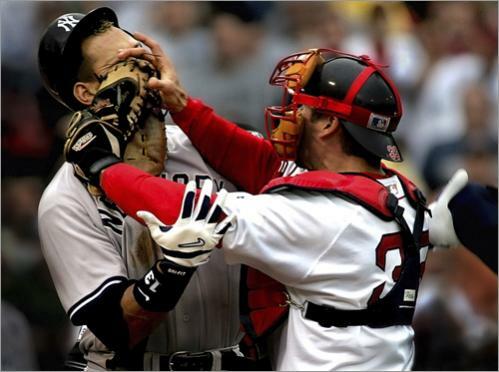 Let's go Sox! Don't be a fool, head to NY for the annual FDR Fools Fest at FDR Park in Yorktown, NY this Saturday. This event kicks off a busy NEFA and PDGA season! Can you handle 54 holes in 1 day? Can you handle 54 holes in one day? If so, play Tourney 54 this Saturday at Newton Hill in Worcester, MA and Pyramids in Leicester, MA. There are still spots left for this annual test of stamina. Just don't lock your keys in your car. If 36 holes is more your style, head to Maine for the Woodland Valley Doubles in Limerick, ME on Saturday or Spring Break Doubles in Auburn, ME on Sunday. Check the NEFA schedule for more info. Forum users -- read this! Please take this message as your two week warning that the NEFA Forums will begin the process of switching over to your real names as posters rather than usernames/nicknames that you may have entered when you first registered. Your login ID's however, will stay as is. This comes after a strong discussion about this topic late last year when last year's BOD took this issue up and voted to change to realnames 10-3. The conversation continued into this year and the new BOD also voted in favor of this change 12-1. We have added a field under your name for you to enter a preferred nickname if you so choose to hopefully appease as many of our members as we can. It is time for us to begin enforcing our user agreements; anonymous posting on the NEFA discussion board will not be tolerated any longer. Once we make the change to all real names, ALL POSTS, PREVIOUS & FUTURE, WILL APPEAR WITH THE NAME OF THE PERSON THAT POSTED IT. 1. Register a new login with your real name and the "unfavorable login ID" will be deactivated. If you choose this option and want to use the email attached to the "unfavorable login ID", just change the email address before creating the new ID. 2. Get busy searching your nickname ID and editing out anything you don't want attached to your real name. We can give you some time to do this but there will be a deadline established.